3Pillar Global’s Cluj-Napoca office will host a launch party for the 63rd issue of Today Software Magazine on Tuesday, September 19th, 2017. The launch event will be held in HUGO, The Office, Cluj-Napoca, from 6 PM onwards. This marks the 9th launch of an issue of Today Software Magazine to be held by 3Pillar Global in the past five years. 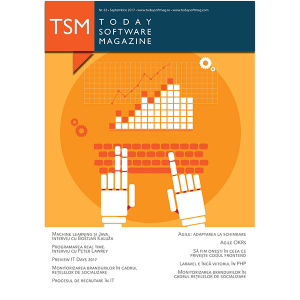 This issue’s launch is based on the theme of Front-end and Agile development. Our Director of Global Learning and Development, Dan Mircea Suciu, will be giving a presentation titled “Agile: Adapting to Change,” which is based on an article by the same name that he wrote for the 63rd issue of the magazine. After the presentation, Tiberiu Cifor, Associate Director with 3Pillar Global in Cluj-Napoca, will join Dan and other speakers for a panel discussion in which they’ll respond to queries from the audience on Agile development trends they’re seeing. If you are reading this from Romania and are interested in attending, you can RSVP for the event on the Today Software Magazine Facebook page.